Is it just me, or are there a lot of White House themed shows popping up these days? I was up to an unholy hour last night working on a project and had neglected to pull myself away to get up and change the channel on the TV. A show appeared on my screen that I had never laid eyes on before. By the look of the set and the Fresh-Prince-knock-off music, I could immediately deduce that this was a sitcom, and not a good one. The show takes place pretty much entirely in the White House, and follows the hi-larious family life of the U.S. President. Beside his being black, the character's movement and style of speech peg him as an obvious Obama analogue - but with a thin goatee to offer a degree of plausible deniability. His family is full of "colorful characters", including his relatively normal tween-ish children, his I'm-a-strong-woman-and-you're-sure-gonna-know-it wife, and incidentally, Gladys Knight as an overly "urban" live-in grandma or aunt or... something, I don't know. As I hear the back-and-forth dialogue between family members as they pose and pout for the camera, I can't help but think of the classic "Full House". The laugh-track (of course there's a laugh track) is a smidge more obnoxious than it needs to be, and often broke in with a confusing chours of laughs in response to dialogue I could not even identify as an attempt at a joke. I mean literally, the construction of the speech did not contain any discernible allowance for there to be a joke there. Yet there was the laugh track! Apart from the President of the United States thing, The plotlines seem to be the tried and true sitcom fare. In the one episode, the President is invited by his daughter to "Bring Your Parent to School" day, where a number of her classmates (in an admittedly cute exchange) forgo the typical "what is your favorite color?" inquiries and ask the President some sophisticated questions about the economy and foreign relations - To which he provides the conventional "government-is-the-solution" soundbyte answers (if the previous Obama comparisons weren't enough). In usual sitcom fashion though, the President clumsily reveals to his daughter's classmate that she likes him. The obligatory "I'm angry with you daddy!" and "how could my husband do something so stupid!" scenes ensue. Spoiler - At the end they make up and hug! Wow! The next episode (yep, they subjected the viewers to 3 episodes of this in a row) presented a dubious moral lesson. There's a reoccurring character in this show, a "comedic" foil to the President character, I think he's a Senator or something? - Forgive me, but it really seems like this character is supposed to be their "Scheming Rich White Republican Guy™" (don't worry, I consider both parties little more than a bunch of schemers) who wants to wiggle his way into the Presidency any way possible. Anyway, this Senator guy is supposedly a ping pong master and in an attempt to embarrass him, challenges the President to a match, wagering 5 million dollars to the President's choice of charity. The President declines this offer (for a reason I'm not clear on) and after the Senator basically calls him a "chicken", the First Lady gives the President some odd speech about how when they were first dating, he would get so jealous and protective and she missed that "fire in his eyes". The President is apparently inspired by this speech and agrees to this goofy match which takes place in the Oval Office. You see a zoom-in on the center of the table, with balls zooming past the camera, and then a few quick cuts of each man feverishly waving their paddles. The President wins the match - I guess. The Senator hands over a 5 mil check and that's basically the end. 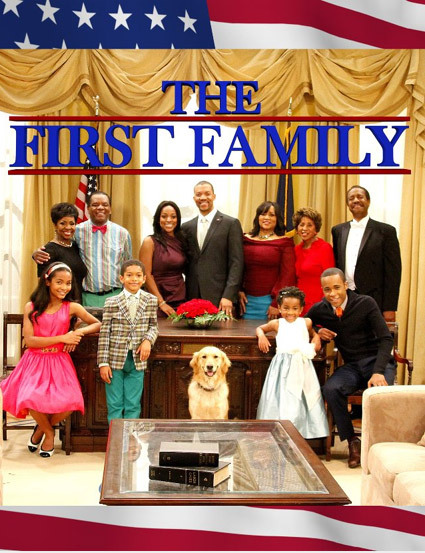 Overall The First Family comes off like "The Fresh Prince of D.C." It is hilariously awful 100% All-American 1991-dated cheese... and you should see it for yourself if you can.